In the basement of a startup lab in San Francisco, scientist Kyle Taylor stands in a dark, windowless room. “I kind of like to have a big reveal,” he said, taking out a small plant that shined like a nightlight. The mouse-ear cress had been injected with firefly DNA so it emitted a soft green glow. 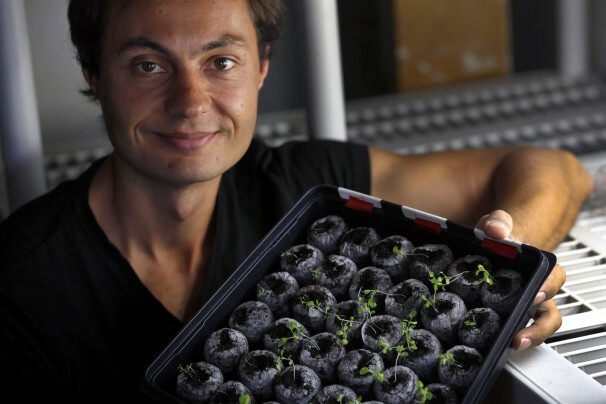 Taylor is the biotechnologist behind Glowing Plants, a synthetic-biology startup company that plans to sell engineered seeds to the public in December. To create the glow, Taylor uses a gene gun filled with high-pressure helium to blast a DNA sequence into small plant cells on a petri dish. The sequence contains luciferase, the light-emitting compound found in fireflies. Less than 1 percent of the tiny plants accept the genes, but the successful ones mature and start emitting light after two months. CEO Antony Evans’ end goal is to create glowing trees that could replace street lamps to illuminate cities. Trees also can also live for hundreds of years, he added, meaning they wouldn’t need to be replaced as often as roadside lights. Evans’ vision for the trees and shrubs centers around a paradigm shift about genetically modified organisms. To achieve this, Evans wants to create glowing aromatic plants and plants that repel bugs, or even plants that produce milk. He sees this as a way to dispel the public skepticism and controversy directed at genetic engineering. “A kid who grows up with a glowing plant in his bedroom won’t have a fear of technology,” he said. Evans and Taylor aren’t the only ones who hope to see glowing plants on bedside tables or lighting up rooftop gardens. More than 8,000 people backed Evans’ Kickstarter campaign, which raised nearly $500,000 in a month. The project is also receiving support from Y Combinator, a prominent venture capital fund in Mountain View, CA, that pumped $120,000 into the project in May. Evans’ company is taking pre-orders, which are priced at $40 for a batch of 50 to 100 seeds. But the idea of turning plants into virtual light bulbs has raised concern among some environmental groups. 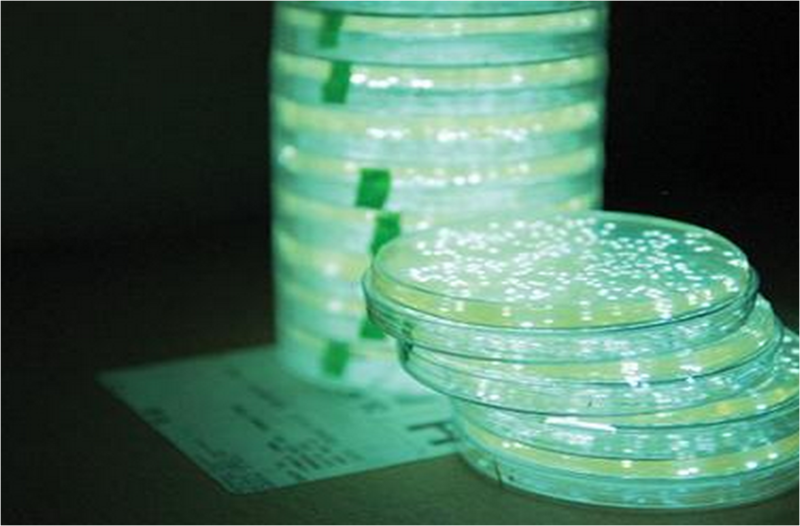 Federal and state laws pertaining to bioengineered plants are inadequate, according to Perls. “These plants are virtually unregulated,” she said. The Plant Protection Act, a federal law, requires that organisms which might harm plants may not be engineered or inserted into plants and distributed without regulatory approval. Mouse-ear cress and luciferase are not considered harmful according to the United States Department of Agriculture. However, agrobacterium, bacteria the company initially used to insert firefly DNA, is considered a plant pest. Evans said he is unsure whether he’ll use agrobacterium in the final product, but if he does, the company will need to apply for a permit. Jim Thomas, research program manager for the ETC Group, an international technology watchdog group, said Glowing Plants is operating with little oversight. “The Glowing Plants guys ran a truck through scant regulations around genetic engineering,” he said. Critics are worried that the plants will spread with unknown effects on soil, pollinators, native plants and other wildlife. Last year ETC Group and Friends of the Earth sent a letter to Kickstarter and the USDA asking them to shut the project down. Kickstarter has since banned GMOs being given out as rewards for project backers. Responses from the USDA’s Animal and Plant Health Inspection Service, which has jurisdiction over the plants, have been vague. 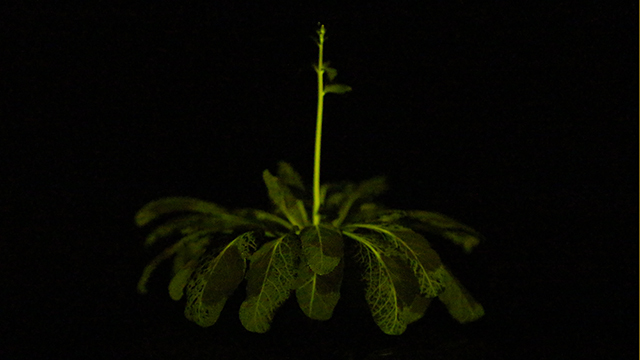 Despite the opposition, Evans believes that glowing plants are a rare opportunity for scientific advancement. It will be the free market that “fixes” climate change, by inventions like this. Plants evolved not to glow. Birds have enough issues with their migratory paths without glowing plants. Nature has this covered already. Trees already remove much carbon from the air. Let’s just plant more trees and not “fix” trees and then have to deal with the unpleasant and unintended consequences that are bound to develop. There is too much artificial stuff in cities already. Nice try, really, but when I look at a tree I want to see the green, natural beauty. When insects eat those leafs will they start glowing or will they die? I like it when an artificial green light is pointed at a tree at night, you can do that, energy is abundent anyway, but lets keep Avatar like forests to Hollywood. Prev How Do We Prioritize Protecting Species in the Face of Climate Change? Next Will Recycling Phosphorus Help Stop Algae Blooms?